The McKean County Arts Council, located at 80 E. Corydon Street in Bradford, Pennsylvania, is a group of like-minded community members who are dedicated to enriching McKean County by cultivating, promoting, and supporting local art and artists. 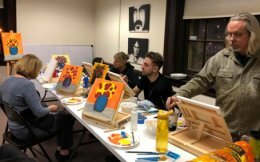 The mission of the McKean County Arts Council is to provide a wide range of artistic and educational opportunities to residents and visitors of the area. They want to give artists a way to collaborate and share information with each other. Join today if you have a interest in the arts or in supporting their cause.